Today I want to talk more about one of the quotes I posted earlier in the week for #inspireMEMonday because it was a breakthrough for me in terms of understanding why I sometimes struggle more than I need to in difficult relationships. As I explained in Monday's post, what this quote means to me is something along the lines of, "listen to yourself, listen to your body." In other words, if - after an interaction with another human being - you feel angry or hurt or yucky, don't just dismiss that, listen to it. That feeling is trying to tell you something. What I realized in my latest session with my counselor (Dr Cat) is that I have not been listening, for YEARS. When someone does something that hurts me or makes me angry I feel the feeling, but almost immediately I turn it around on myself and start berating myself: "Don't take it personally." "Let it go." "If you were a bigger person this wouldn't bother you." Etc. On the face of it this may look like an okay way to go. "Letting it go" is very big in our culture right now and I believe that LIG has its place, but that place is not as soon as you feel the feelings. There is a lot of work to do between being hurt and letting it go. Dr Cat helped me understand by asking me this question: If someone punched you in the stomach would you say the same thing to yourself, or would you allow yourself to feel hurt? I said that I would not try and talk myself out of feeling hurt if someone punched me. Same thing, I said, I wouldn't try and talk myself out of the pain. Emotional pain isn't any different, she went on. If it hurts, it hurts and it is trying to tell you that what that person did is not okay WITH YOU. The WITH YOU is very important here for a couple of reasons 1) It takes judgement out of the equation. You are not saying that what the person did is not okay ever, just that it is not okay with you; 2) It affirms - for you - that this is true even if the other person does not accept it. "I didn't mean to hurt you." "I was (stressed, busy, hungry, insert any excuse here)." "You (insert attempt to pin the blame on you, bring up the past, etc.)" And while all of these things may be true, in this moment YOU are attempting to communicate your hurt and all of these responses are nothing more than attempts to deflect. EVEN IF - maybe especially if - they are preceded by an apology. As in, "I'm sorry, BUT..." An apology that includes a BUT is no apology at all. 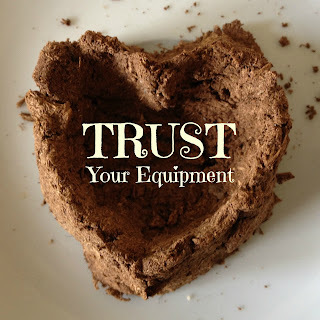 So the first thing to do when you have been hurt is to TRUST YOUR EQUIPMENT. If something hurts, it hurts. If something makes you angry, it makes you angry. If something makes you scared, it makes you scared. This one, the FEAR one, is SO important because this is an area where we really seem to get off on minimizing our feelings as well as those of the people around us. We do this to kids ALL the time, "Don't be afraid." FEAR, like the pain that comes from a slap in the face, is not a choice. How you ACT in the face of fear absolutely is, and one of the keys to acting with courage is acknowledging your fear, letting it have its say, and working to make the situation safe for you so that you CAN act. Once you have acknowledged your feelings, felt them and taken care of yourself around them (by talking to a friend, meditating, taking a walk, etc.) then you can act to repair the relationship by communicating your hurt to the other person if you decide you want to and that it is safe to do so. It is not always safe. If you have made attempts in the past to communicate your hurt or anger to someone and they have responded defensively or dismissively with the classic "I'm sorry BUT...." at some point you may decide that it is not in your best interest to keep trying. Or you may value this relationship so much that you want to try in spite of these responses. Either is a valid way to go so long as YOU don't stop trusting your equipment. Dr Cat explained it this way, If you had a dance partner that repeatedly stepped on your toes and didn't apologize or made excuses, sooner or later you would stop dancing with them. EVEN IF you liked them. EVEN IF they had other good qualities. You don't have to hate the dancer to stop dancing with them. You just have to hate having your toes stepped on over and over (and over) again. situations with this person (the ones in which your toes always seem to get stepped on), or setting a clear boundary for expectations within the relationship. In some cases it may involve ending the relationship. Whatever the specifics of your situation, it all starts with TRUSTING YOUR EQUIPMENT. Next week I am going to write about one technique that works really well for me in situations like this, especially if the "relationship" in question is one you can't so easily get out of (for example with a boss or family member). ** The above conversation is paraphrased and does not include direct quotes from myself or Dr Cat. As such I have italicized it, but have not used quotation marks.